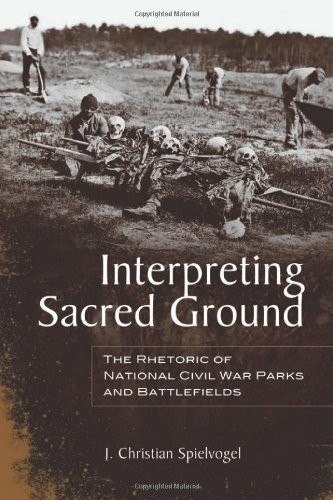 Interpreting Sacred Ground is a rhetorical analysis of Civil War battlefields and parks, and the ways various commemorative traditionsÃ¢ÂÂand their ideologies of race, reconciliation, emancipation, and masculinityÃ¢ÂÂcompete for dominance. The National Park Service (NPS) is known for its role in the preservation of public sites deemed to have historic, cultural, and natural significance. In Interpreting Sacred Ground, J. Christian Spielvogel studies the NPSÃ¢ÂÂs secondary role as an interpreter or creator of meaning at such sites, specifically Gettysburg National Military Park, Harpers Ferry National Historical Park, and Cold Harbor Visitor Center. Spielvogel studies in detail the museums, films, publications, tours, signage, and other media at these sites, and he studies and analyzes how they shape the meanings that visitors are invited to construct. Though the NPS began developing interpretive exhibits in the 1990s that highlighted slavery and emancipation as central facets to understanding the war, Spielvogel argues that the NPS in some instances preserves outmoded narratives of white reconciliation and heroic masculinity, obscuring the race-related causes and consequences of the war as well as the warÃ¢ÂÂs savagery. The challenges the NPS faces in addressing these issues are many, from avoiding unbalanced criticism of either the Union or the Confederacy, to foregrounding race and violence as central issues, preserving clear and accurate renderingsof battlefield movements and strategies, and contending with the various public constituencies with their own interpretive stakes in the battle for public memory. Spielvogel concludes by arguing for the National Park ServiceÃ¢ÂÂs crucial role as a critical voice in shaping twentieth-first-century Civil War public memory and highlights the issues the agency faces as it strives to maintain historical integrity while contending with antiquated renderings of the past. About: Interpreting Sacred Ground is a rhetorical analysis of Civil War battlefields and parks, and the ways various commemorative traditionsâand their ideologies of race, reconciliation, emancipation, and masculinityâcompete for dominance.